Ready to start your own blog? Be sure to check out our FREE guide of how to get started! Want to grow your blog? Get our 5 foolproof tips here! We also share all of our best blogging tips and tricks each week – you can find them all HERE. When it comes to blogging, we get asked all the time how we make money from our blog. So what the heck is an eBook? It’s an electronic version of a printed book that can be read on a computer or handheld device designed specifically for this purpose. Our ebooks are really more of eCookbooks. We took our most popular posts and expanded the topic – for example, one of our most popular posts is How To Make 8 Freezer Meals in 1 Hour. We then released our eBook – 75 of the Best Freezer Meal Recipes. Do you feel like you have something to offer to other bloggers, your readers, or anyone who happens to stumble on your site? You should write an e-Book! An eBook is such a great way to establish credibility and expertise in your niche (plus a great way to generate some extra income!). The easiest way to do it is to publish it as a PDF file and sell it for a couple of dollars. When we sold our first eBook, we set up a PayPal account and would manually email the PDF file to each person who purchased it. As we started selling more and more, we looked into ways to simplify that process. We found e-Junkie and have never looked back! We uploaded our PDF file to eJunkie and added the link to our site. For a small fee each month (usually $5-$10 bucks), they take care of the distribution of each product sold (meaning you can’t have to email each one out yourself) and collect the money via PayPal. You can even use them to set up an affiliate program and let other people sell your eBook, which is a great way to sell even more. When it comes to a game plan of writing an eBook, we highly suggest the Book Boss Course. Coming up with an idea, then a game plan to finish the eBook, then a marketing strategy, and all the millions of details in-between can be SO overwhelming. This course helps you write an launch a profitable eBook in 90 days or less. We LOVE this program and have used it and HIGHLY recommend it to anyone. This course will literally increase the income you make on your blog exponentially. Check it out HERE. -What kind of eBook should I write? You will definitely want to write about something that you feel knowledgeable in. Do you have information that other people would pay you for? One way to decide what to write an eBook about is to look at your most popular posts- obviously people keep coming back to them and there is a lot of interest in them! One of our most popular posts was 25 slow cooker recipes that we had compiled. So for our very first eBook, we put together 25 more slow cooker recipes, took pictures, and made it into a recipe eBook. It has made us about an extra $200-$300 a month without any advertising or work on our part except for a button in our sidebar. We have since changed our strategy and updated the eBook to be 50 of our favorite slow cooker recipes and we sell it for $4.99. It probably took less than 20 hours to put together and now we just sit back and reap the rewards. Many of the recipes in the eBook can be found on our website, but people will pay for the convenience of having it all together in one little package where they can easily access it or print it off. Another idea to help you know what to write about is to ask your audience what they want from you. We have sent out an email asking what our readers want, asked on social media, and sent out surveys to our followers asking what they would prefer. If there seems to be an answer that keeps popping up, you might be on to something!! -How long should I make it? The sky is the limit! Really, 5-30 pages should be enough to motivate people to buy it. Our Grow Your Blog eBook is about 25 pages, the Gluten Free eBook is 15 pages long . . . You could charge more for a longer eBook, but keep in mind that you will probably sell less copies of it. I have seen a couple of 200-page eBooks available and they are great! It?s a lot of work on your end and you deserve to be paid more per book, but you will not sell as many as you would if it was a lower price – BUT because you are selling it at a higher price, you make more money per sale. One thing that we learned is that you start high and you can always lower the price of your book or offer a discount code to make it less expensive. Make an outline of what you want to cover, such as topics, sections, chapters, etc. Decide how many pages you will dedicate to each. 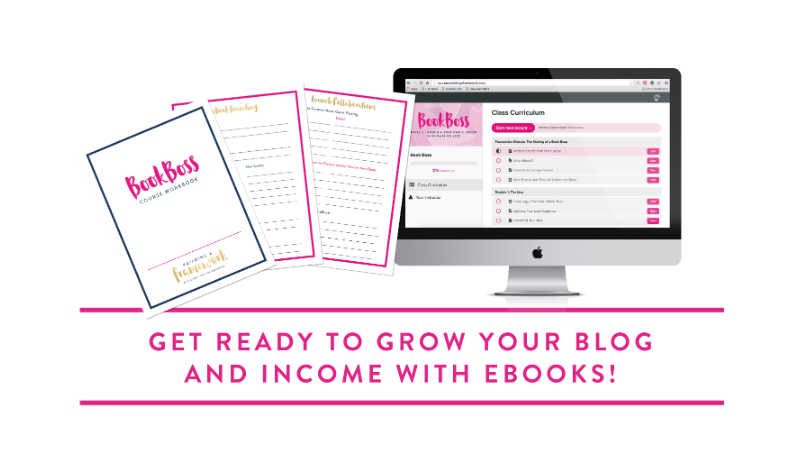 Make a schedule of when you will set aside time to work on your book – the Book Boss Course is awesome for helping you set a schedule to get it done in 90 days or less. From there, work on a rough draft of each section and then add finishing touches. Don?t forget to have a couple of people proofread it and help you with any grammatical errors. Like I mentioned before, most eBooks are just a PDF file and there are lots of free programs that you can use to write it. We just used Microsoft Word and saved it as a PDF file (Adobe Create PDF is also a great program to use). -Where do you get a 3D cover for your eBook? -How do I sell my eBook? As I said before, eJunkie has been such a lifesaver for us. You upload the PDF file and then copy and paste the links and buttons that they provide onto your blog – it’s easy and seamless. It usually costs $5-$10/month, but if you sell just 1-2 books, it pays for itself! EJunkie allows you to literally sell eBooks while you sleep and wake up with money in your account – and you don’t have to do one thing! For help in this area, we have loved the plan that is outlined for you in the Book Boss Course. After the initial launch, we highly recommend setting up an affiliate program. We are a big fan of their affiliate programs because it helps you reach more buyers and creates a positive buzz about your book. At this time, we offer a 50% commission to our affiliates – we want it to be worth their time and make them want to promote our book. It’s a win-win situation for both parties. If you do start an affiliate program, don?t hesitate to email other bloggers and let them know. Everyone is always looking for more ways to make some extra money! You will have to figure out what you want to charge for your book. When we discussed what to charge, we decided that we wanted to keep our prices low so that people would not even hesitate purchasing our book. However, you need to be compensated for the time you put into your book, so find a happy medium. Also consider offering a money-back guarantee if people are not satisfied with the book, offering giveaways of the book on other blogs (a great way to promote it! ), and offering discount coupons and sales every once in a while to drive more sales. The take-away message of this post is that it’s time for you to write an eBook. 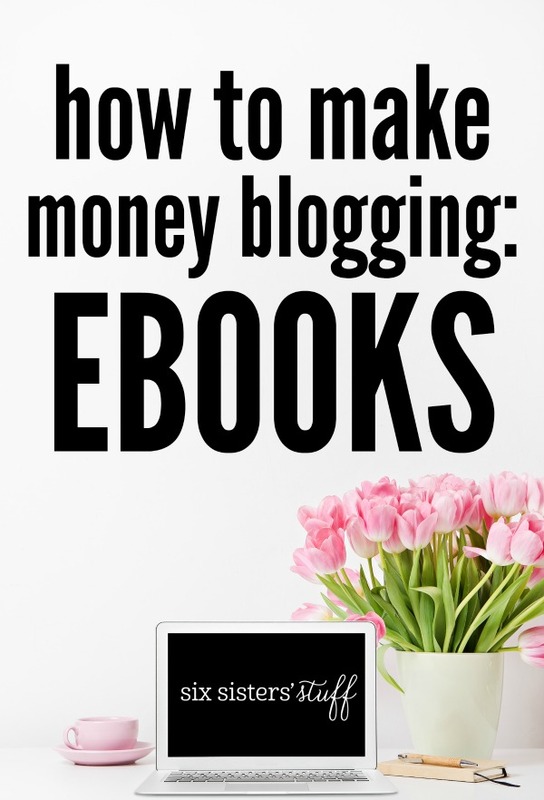 Whether you are just starting your blog or have been blogging for years, an eBook is such a GREAT way to make income through your blog. hi sisters, you really offer great stuff about ebooks blogging, get this information at the right time. please keep on sharing your valuable stuff.